Who is Muriel and what happened to her to turn her life into a dysfunctional calamity and threaten to do the same to her children? Even at the end of this memoir, set in London in the early to mid 20th century, we have no certainties, only likelihoods. Muriel’s character was full of discords: in peacetime she was a needy drunk, but in two world wars she was efficient, hardworking and willing to take her work to the front line. Diana Petre was her daughter and struggled with a confused and chaotic upbringing. But her book is anything but chaotic; in a plain but very clear style she analyses events and feelings, keeps track of several lives and gives us a clear vision of her mother and of Roger Ackerley, her father. This book is part memoir and part ‘true story’ mystery, and even though the mystery is only partly solved, it is a satisfying read. When I opened my blog this morning I realised that it is well over a month since I posted anything. So I have made a new New Year resolution – to post more frequently. The exercise routine resolution is already not happening, so I hope this new one will be more successful. On the other hand, I have done a lot of reading, most of which is recorded in Goodreads. Listing my reading in Goodreads is very useful; browsing back through my previous entries I find that I often forget what I’ve read and need a reminder. On the submissions front I’ve had a few successes so far this year. Pulsar, a longstanding online magazine, has published one of my poems and you can find it among a group of great poems, ostensibly for March but on line now. Paragraph Planet, an online flash magazine, has taken one of my very short tales (to read it you have to scroll through the archive to Jan 31). In case you aren’t familiar with this site, it publishes a 75 word story every day and some of them are really amazing – so much said in such a little space. I’ve also had a couple of acceptances and am waiting for actual publication. Good luck to anyone else on the submissions circuit and to anyone thinking of starting it – it can be fun. I enjoyed this book. 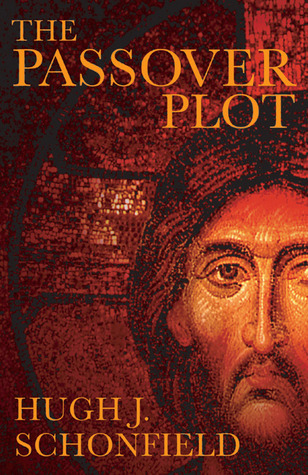 It is well written and scholarly without being pedantic or heavy. However, I did find it odd reading a biography of people who don’t exist. For instance, as many biographers do, Ms Thomson speculates on what her characters were doing in the times not covered by the published stories. For real people this attempt to fill in gaps makes sense – they must have been doing something. But for fictional characters the true answer is ‘nothing’, and most of the time their creator probably didn’t give the question any thought. Reading this book has made me want to know more of the real facts and I hope to find a good biography of Conan Doyle in the nearish future. 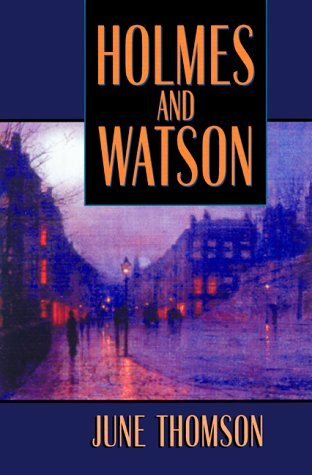 I recommend this to anyone who enjoys the Holmes stories and who likes a stylish, fictional biography. If you haven’t read any of the stories you’ll miss out on a good deal of the references and nuances, so I suggest you get a few of them in before starting Ms Thomson’s work. Congratulations to Eimear McBride for winning the Baileys Women’s Prize for fiction. It’s nice to read about someone pushing the envelope of the novel out and being rewarded for their courage. Also announced yesterday was the lower-key but still important HWA Debut Crown shortlist. The Historical Writers Association has decided that they too should have a range of awards similar to those given by the Crime Writers Association (CWA). It’s lovely to read about these successes. But I still wonder about those who don’t win them. Does the existence of a prizewinner affect other people’s sales? As a reader I also wonder if all the hype and publicity skews what I read. While wandering round a bookshop I’m likely to pick up books I’ve heard of, even if I can’t recall why they seem familiar. Does winning a prize affect a book’s long term sales? Or does it fade from popularity as fast as it would without the prize? We seem to live in a world of awards and competitions. Is this a good thing? bad? totally irrelevant? I recently went to Crimefest, and had a really good time. Among the many tables dedicated to books is a swap table. Browsing through the books left for swap I saw one with ‘Johnson County Library’ and a bar code on its cover. My first reaction was that someone had left their library book by mistake; then I opened it and inside was printed ‘Withdrawn from Johnson County Library’. So it was the result of library weeding and it was OK to take it. 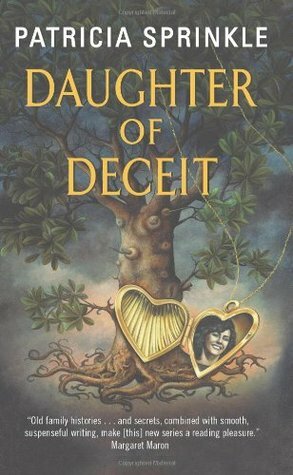 The book was Daughter of Deceit by Patricia Sprinkle, an author I’d not heard of. I’m not sure if her work is available in the UK – Johnson County sounds like it’s somewhere in America. I really enjoyed it. I’m so glad that someone at Crimefest left it. Now that I’ve read it I feel honour bound to pass it on to one of the local secondhand bookshelves so someone else can enjoy it too. It is set among the very rich in Atlanta. Not an underworld setting – well-mannered, well-dressed women living in beautiful houses in a lovely town. Like my own, less wealthy, neighbours they spend their time raising families and raising funds for good causes. The mystery, when it strikes, is all the more shocking for being in such a society. A middle-aged woman deeply into genealogy is called upon to help a woman neighbour whose world has been turned upside down by the discovery that her late father may not have been related to her at all. How did he really feel about her? Is she entitled to the wealth she’s inherited? And, to top it all, did she really shoot her husband? I will certainly look out for more of Ms Sprinkle’s work. A few days ago I posted my last instalment of this challenge. I have to thank the writers of Snobbery for setting me going on what has turned out to be a long journey. Most of the route has been down memory lane and it’s been useful, and at times exciting, to scour my recollections of past reading in order to write the posts. Looking back I see I’ve read a lot of great stuff. Remembering the books has also made me remember how I felt on reading them: I had forgotten that I cried over Black Beauty, felt really cross with Dennis Wheatley, and thrilled at the description of the research in Josephine Tey’s Daughter of Time. My original plan of writing one post a week has long since failed, but I think that may have been a good thing, giving me more time to mull over what to write and, importantly, what to leave out. I’ve considered taking up the NaPoWriMo challenge but, if I can’t stick to once a week, every day has no chance. This is an anonymous quote and I think I’ve come across it several times in the past. My own feeling is that the extra lives available from books are usually only part lives – very few books cover the whole of someone’s life. But if you read a lot, think how many extra lives you’ll have had by the time you reach the end of your real one. There are, of course, other ways of getting these extras. Story and biography telling were originally oral. Sitting round the fire listening to the wise woman’s description of the deeds of your ancestors must have been similar to sitting in the library reading about Harry Potter. Even when we aren’t reading, other lives are available to us through imagination. Last time I was at an airport, waiting for my flight to be called and annoyed at how time was crawling rather than running, I started to wonder where all my fellow waitees were in their minds. Perhaps they were exploring alien planets, swimming the coral sea, winning in the Olympics or dating the boy next door. We also get some extra moments in our dreams. I frequently dream whole days with friends I haven’t seen for years or even with people I’ve never met. These too are extra experiences that add to our down-to-earth real-time lifespan. While browsing through Twitter I came across mention of The Islamic Manuscript Association. I’d not heard of it before so naturally I googled it. Their website led me down several new-to-me and forgotten-by-me paths of knowledge. Among other things they have a list of links to relevant organisations, and what should I find there but a link to the Library of Congress Romanization Tables, which I used to consult when I was a student working part time filing Library of Congress cards. One for Memory Lane. Another of their links led to an organisation called Thesaurus Islamicus which is concerned with preservation of the Islamic patrimony. I’m not sure why they include ‘Thesaurus’ in their name as they seem to do much more than assemble words. And I found a lovely new-to-me word: codicology. It is the study of books as physical objects. It’s apparently a slightly vague term. It may include things like studying the handwriting, marginalia and illustrations as well as attributes like inks, paper, parchment, binding and so on. According to Wikipedia, codicologists may also study the history of libraries and other collections. A special word for the study of books! I really like that. So now when I buy a new book because I admire its binding and illustrations I’m participating, in a tiny way, in codicology. You can’t stop a booklover. This is such a fantastic picture. My thanks to Travel Between the Pages for posting it.